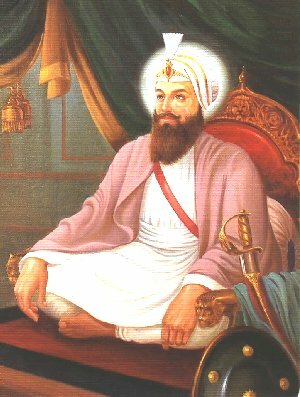 Guru Hargobind Sahib wore two swords, one of Spiritual Power - Piri and the other of Military Power - Miri. Now the Sikh became "Saint-Soldier." Guru Sahib issued various letters advising the Sikhs to take part in the military training and marshal arts. A Chronicler states that Guru Sahib kept seven hundred Cavaliers and sixty artillerymen. There was a band of Pathan mercenaries and Painda Khan Pathan was made its chief. Riding, hunting, wrestling and many others martial sports were introduced. And on the other hand the martial songs like 'Vars' were daily sung by the Dhadd-players in the court of Guru Sahib to inspire the Sikhs of heroic deeds. Abdul and Natha Mal were given the task in this respect. The Guru Sahib himself was healthy and strong in body and mind. He himself learnt the use of different weapons, besides riding wrestling and hunting.